Do you want to know what the outlook is for the pest control industry in the U.S.? If analyzing the U.S. internet search data from Google is any indication, then the pest industry is probably a good one to bet on. 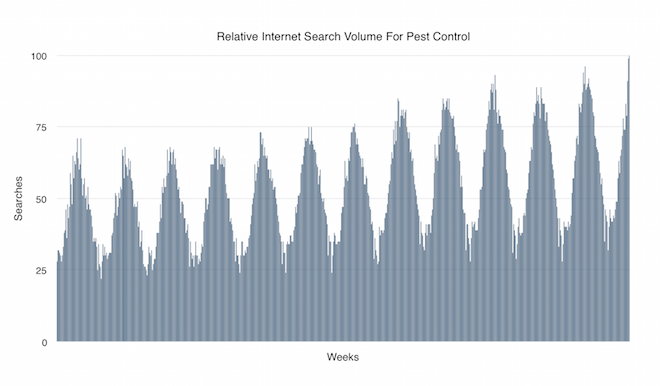 In this post, you’ll get a visual of the relative internet search volume and trends for pest control of each week since the beginning of 2004. 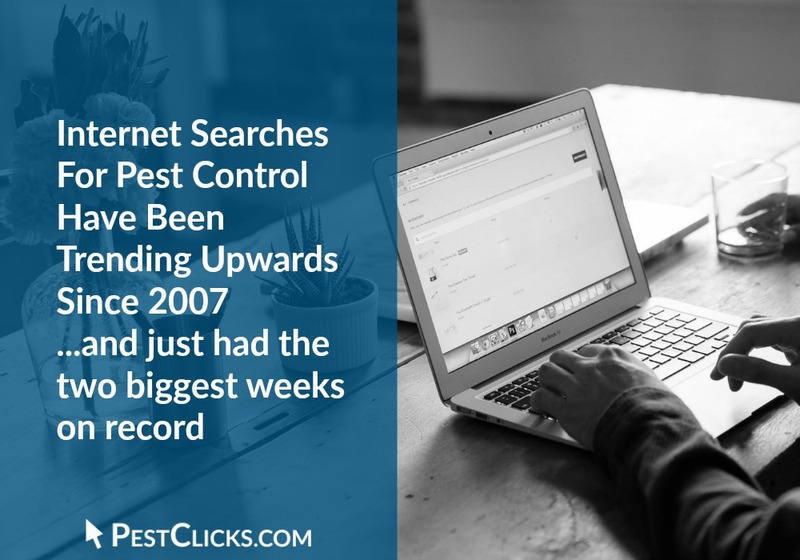 The week of May 29th through June 4th, 2016 had the most internet searches for pest control on record (dating back to 2004). The very next week, June 5th through June 11th, a new record was set. I have a few thoughts about why we just had the two biggest weeks for search volume. One of those thoughts starts with a ‘z’ and ends with an ‘ika’. But the trend has been upward long before zika, so I’d love to hear your thoughts. To create the visual, we took the relative Google search data (U.S. searches only) from the first week of 2004 through June 11th of 2016. Then we did our best to squeeze each week onto one graphic. There are huge peaks each summer and deep valleys each winter. You’ll also notice the trend was fairly flat from 2004 through 2007 (the first four peaks). Since then, however, pest control has been trending upward. If you have great eyes you’ll notice that the very last week (June 5th through June 11th) touches the 100 mark (edging out the previous week by 1%). All other weeks are relative to the top week. What Are Your Thoughts On the Industry Trend or Search Volume Trend? We’d love to hear your thoughts on why the industry has had such a consistent trend upwards for several years. You can leave your comments under this post on our new LinkedIn page or submit your thoughts via our contact page.